Companies that can adapt to the fast pace of change enabled by the Internet of Things have an unprecedented opportunity to accelerate innovation, meet increasing consumer expectations and gain advantages in a new era of competition. Continuous engineering can help manufacturers transform their business models to take advantage of the opportunities offered by the IoT, while enabling engineers to address the challenges of developing the next generation of smart products. 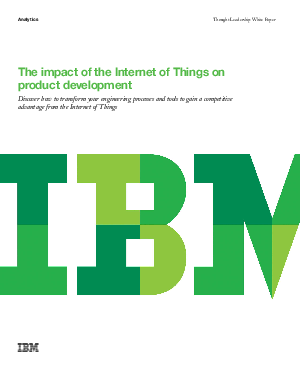 Learn more in this IBM white paper, which explores how you can use the best practices of continuous engineering to harness the power of the IoT and increase the pace of innovation to obtain a strategic advantage.